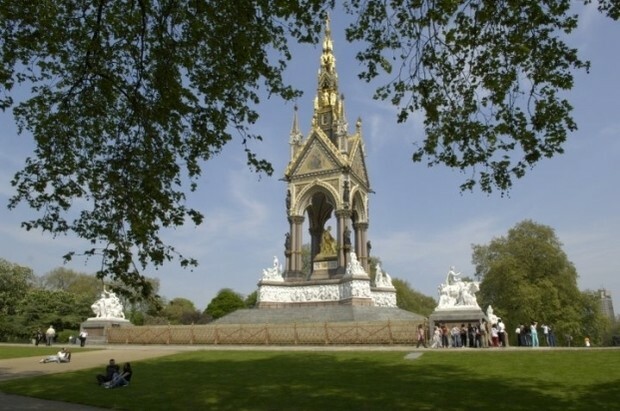 The Albert Memorial in Kensington Gardens is one of the grandest high-Victorian gothic extravaganzas anywhere. It was designed by George Gilbert Scott, and completed in 1876. Prince Albert – Queen Victoria’s husband – died of typhoid fever at the age of 42. Soon after his death it was determined that a national memorial be created to recognise the British public’s deep sense of loss. Officially titled the Prince Consort National Memorial, it celebrates Victorian achievement and Prince Albert’s passions and interests. Joely Richardson worked with Vocaleyes describer Veronika Hyks on the description of the Albert Memorial for London Beyond Sight (2012). On exiting High Street Kensington tube station turn to your right and walk along Kensington High Street, which turns into Kensington Gore, towards the Royal Albert Hall. You will see Kensington Gardens park on the opposite side of the road just after the Royal Garden Hotel. At the junction of Kensington Gore and Gloucester Road (on your right), cross over Kensington Gore at the traffic lights into the park at Broad Walk. The Albert Memorial is on your right a short walk up a well maintained path opposite the Royal Albert Hall (outside the park) on the other side of Kensington Gore. The pavements in Kensington High Street can be uneven but the pathways within the park are mostly level. There are “Liberty Drives” (electric buggies) within the park which provides free mobility for anyone who finds it difficult to see all 760 acres of Hyde Park and Kensington Gardens. The electric buggies have wheelchair facilities, each seating five people and move around the parks providing half hour rides. It is also possible to be dropped off at a favourite place and be picked up later. Parking is available for disabled drivers at Queen’s Gate or along West Carriage Drive in the designated bays, there is limited parking in the streets surrounding the park and around the Royal Albert Hall.